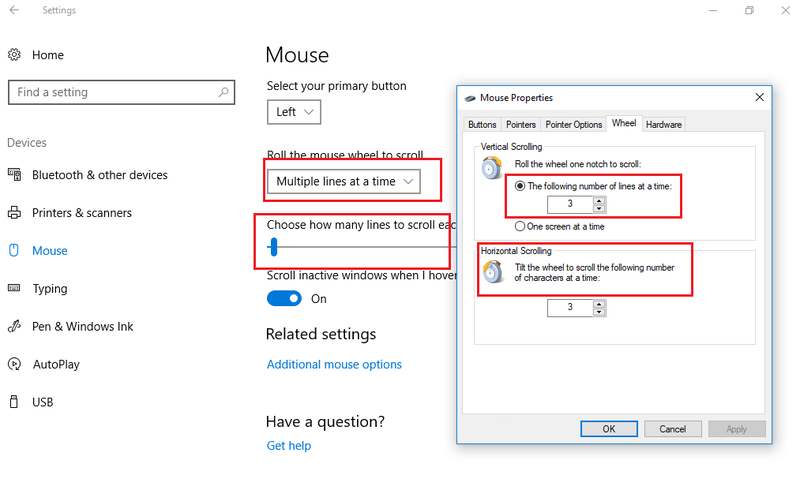 All of a sudden, when I try scrolling through a web page, for every click of the mouse-wheel, it moves up or down a whole page, not smooth scrolling. Yesterday it was still scrolling smoothly. What could have caused this and what can I do about it? EPILOGUE: The problem disappeared somewhere after playing with scroll wheel settings, but they were already correct. I think this behaviour was perhaps just Chrome being wobbly. Go to Control Panel, open devices and printers, click mouse, go to scroll, change the number of lines being scrolled. Mine was to 100 lines, I changed it to 1. Not the answer you're looking for? Browse other questions tagged windows-10 google-chrome mouse-wheel or ask your own question. How to turn off “smart” scrolling mouse wheel in OSX? Mouse wheel scrolls Chrome's page, even when in a textbox - why?